Shatterlight - ver 0.1.0 released! Trying to steer the ship of life away from capsizing. Version 0.1.0.1 contains Shatterlight's first story arc. It is 5 playable chapters, encompassing the prologue. So, as a hobby, I've been tinkering with GBAFE for a surprisingly long time; I'd say a good 7 years, albeit on-and-off. I've wanted to bring to life a full campaign the whole time, and only recently found the courage to put it to the test. With this project comes the fruits of my explorations and ideas, and the talent of the huge amount of people who have offered support. It is my personal goal to bring to life a campaign of engaging gameplay, twists on old FE design, and a level of writing that really brings the world to life. For as long as anyone can remember, you couldn't go more than a mile out to sea without encountering treacherous storms. The continents of Ingenuity and Vigilance (now known as the domain of Shatterlight) have lived in isolation. The only references to each other are in ancient manuscripts. In the east lies Shatterlight; a domain united by an militant, religious order that values honesty and discipline. Those who harbour ill intent and use dangerous magics are punished heavily by their templar. In the west lies Ingenuity; a war-torn landscape of squabbling factions desperate for fertile land. 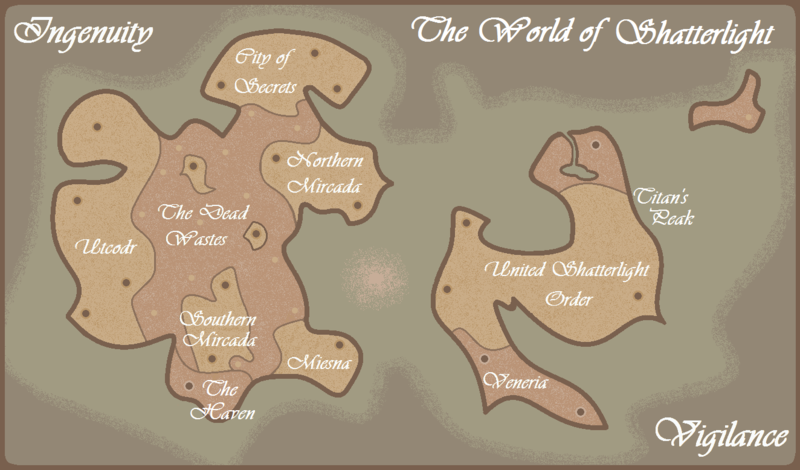 The enormous scar of wasteland marks the continent's troublesome history in powerful arcane magic. Recently, the storms have shifted. Our story follows the trials of Pascal, a diplomat in service to the Shatterlight Order. He has been tasked to lead an expedition around Ingenuity. Will he successfully keep the mage factions and his own boss from going at each others' throats? Will he safely avoid leaving territory open to the agressive expansionist nation of Utcodr? Of course not! Learn the lay of the land, the desires of the people and the plots of those above humanity. The first arc, the prologue, will cover the ravaged wastes of Ingenuity, and the struggles of the nomads with no other home. The scars of the world have started to heal, and everyone is scrabbling to claim the new bounty as theirs. Light magic has a major overhaul. Weight is lowered, crit rate exchanged for hit. All light magic is effective against magic users. A female swordfighter with an all-or-nothing fighting style. Knights and Generals have their movement rate increased to match other footsoldiers. Their poor speed is a large enough detriment. Enemy thieves will no longer steal your vulnies. Thieves get access to knives, and then swords on promotion. In addition to knives is the sap; a weapon that can knock enemies out but cannot counterattack. To compensate their combat issues, their experience gain has been further increased. Male sages exchange staff access for full magic triangle coverage. A glance at culture in Ingenuity. An enemy mine that almost goes wrong. A professional bodyguard with a no-nonsense attitude. A couple of bosses that WILL one-round the lord. Main objectives that can be failed, but you may continue anyway. Enemies that get bored if you turtle too long. Bosses that don't just sit on thrones. Abusing the support system with enemies. Shops won't sell javelins or hand axes. But enemies won't be spamming them, either! Dark and edgy teenage protagonists! ...wait crap, Pascal IS 17. Mass level 30 Wyvern Lords spawning after turn 20 on every chapter! CaFÉ - So many nuggets of informaton. Also proxies as a thanks for every hacking tool made since like, Nightmare 1 and the Text Editing suites. Everyone helping out the event assembler questions thread! Obscure Hacking Tips thread. Really good thread. Madman4q2, for various small errands. A special thank you for Haku, for keeping me going and going, and working so hard on the graphics. So much of this project's work is thanks to him. A special thank you for GK, for doing an absurd amount of graphical work, providing icons on demand and generally being available all the time. Thanks so much! Big one right now is a new set of frames for character stat panels/menus. The base FE7 one doesn't do GabrielKnight's Icons justice. Also desired is music insertion expertise, and animation. Aside from that, if you're good at refining/inserting graphics, I might be interested. I'm kind of confused about this thief skill thing, but I can teach you animation inserting, it's not that difficult. Thieves don't get the steal ability; the thief character does. Thieves and assassins get knives as prfs. The sap is a weapon that shares the knife category, not a skill. I'll try and rephrase it. Dark and edgy teenage protagonists! Excellent, I'm sold. I can, perhaps, give you some creative names? The character with the steal ability is one of our lords, by the way. Just one thing, don't make it effective against the Monk/Priest/Bishop line. Those classes are supposed to be highly resilient to magic, and making a line of tomes effective against them completely ruins it. Mmm so many new hacks this year and yours sounds promising i'll say, the story idea is an interesting one. If there is something i'm good at and yoou need help woth it i could spare a bit of time to help. perhaps. Look out in the near future for my hack. *Inhales* Oh...this is going to be fun! I think this is more "It has WTA on Anima AND Dark Magic." which is why Light magic was so...meh. Alot of the enemy mages were Anima with a sprinkle of Dark thrown around so Light magic with its lower power got bootstomped on. Yeah I figured on the stealing ability, but @sap I'm confused to how you're getting the "knock out" ability. that you put up a long time ago. @Eric - Maybe they've applied the Status Weapon patch and given it Sleep? @KoT: This ASM patch, basically. I've always loved tinkering with this game. I'm really looking forward to making something coherant and polished for a change, though. Same way you get a Sleep stave to sleep for "X" turns. You would create a new version of sleep and set its duration to "X turns"
That said, thrones dispel sleep at the start of every EP. As a tool it'll take a lot of exploring, but I think it's pretty safe from being broken. EDIT: Silver, please don't answer for me. I can't change the turns without extensive ASM fiddling (out of my league), so it's stuck at four turns for now. Fair enough. I was trying to fill in some blanks. I'll stop now. I like the idea, if you need a logo/world map/etc something of that section, I'd be glad to help. I'd love to help with portraits but I've only started making them and would probably lack the experience. Also story designing, pretty much my dream job. I can do bug hunting for you. This actually looks good so far. I do the script, so you can help me with that if you wish. LunaSaint pretty much made the story up himself, and I've made a few minor alterations. He doesn't know I'm doing the same to his names. I'll get in touch with you in a bit, Shugey.